The Hulk is gone - transformed back into Bruce Banner, seemingly forever. But Banner knows the Hulk never stays buried. He knows he must prepare. 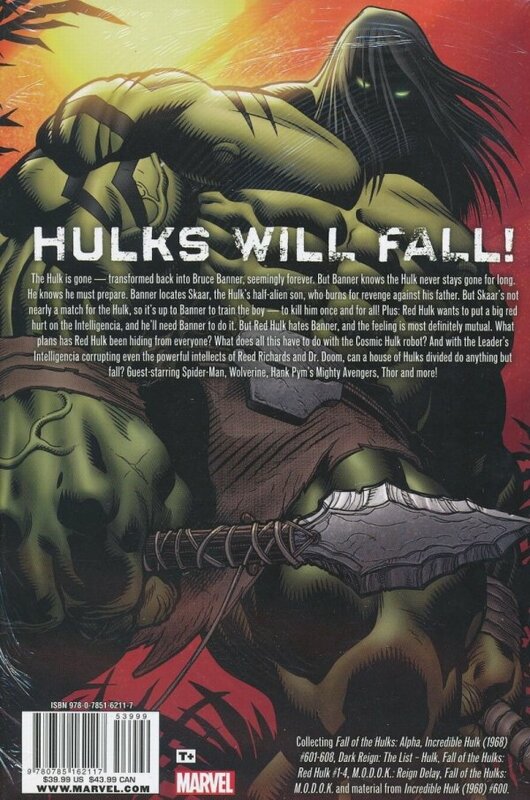 Banner locates Skaar, the Hulk's half-alien son, who burns for revenge on his father. But he's not nearly a match for the Hulk. So now it's up to Banner to train the boy - to kill him once and for all! Plus: Red Hulk wants to put a big red hurt on the Intelligencia, and he'll need Banner to do it. But Red Hulk hates Banner, and the feeling is most definitely mutual. What plans has Rulk been hiding from everyone? What does all this have to do with the Cosmic Hulk robot? And with the Leader's Intelligencia corrupting even the powerful intellects of Reed Richards and Dr. Doom, can a house of Hulks divided do anything but fall? Guest-starring Spider-Man, Wolverine, Hank Pym's Mighty Avengers, Thor and more! Collecting FALL OF THE HULKS: ALPHA, INCREDIBLE HULK (1968) #601-608 and material from #600, DARK REIGN: THE LIST - HULK, FALL OF THE HULKS: RED HULK #1-4, M.O.D.O.K. : REIGN DELAY, and FALL OF THE HULKS: M.O.D.O.K.